Buying a new home is one of the most important financial decisions you’ll make during your lifetime. It can also be one of the most exciting. Our goal is to design homes that fit your unique style. It starts with building communities in some of Atlanta’s most sought-after locations. From there, it extends to the expert craftsmanship and attention to detail that goes into every Rockhaven home. We believe your home is an extension of you. That’s why it’s important to choose the home that best suits your lifestyle. Follow us through a sneak peek of our model home to help you envision life in our new Heights at Grant Park townhomes. 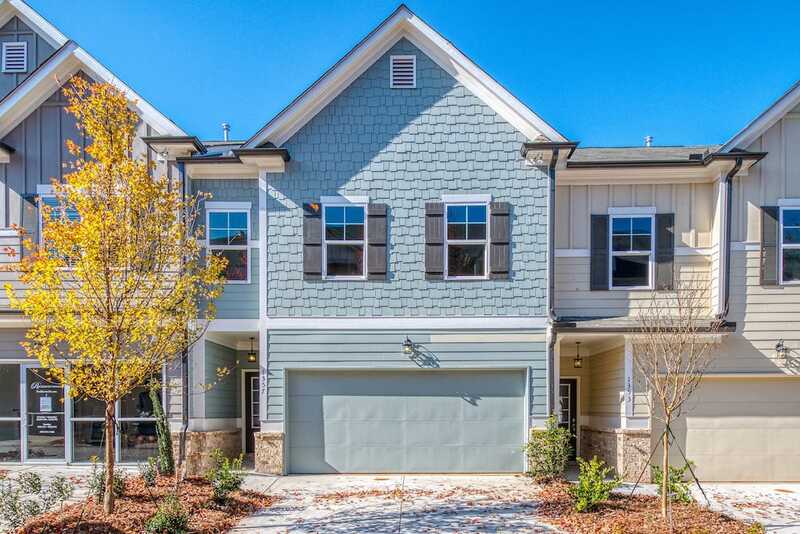 Heights at Grant Park is a community enclave of stunning 3-bedroom townhomes in East Atlanta. Their spacious, open-concept designs give your family the room you need to live comfortably in your new home. Have a seat and stay a while! When you walk through the foyer of these new townhomes, you’re greeted by a wide open family room. With large windows for natural lighting as well as a crackling fireplace for added warmth, this room creates an inviting atmosphere. Its neutral tones make it easy to transform your family room to fit any style from farmhouse to midcentury modern. Adjacent to the family room in our new Heights at Grant Park townhomes is the dining area. Here you’ll envision your family gathering around the table to savor a delicious weeknight dinner or Sunday brunch. Conveniently located by the door to your back patio, it’s in the perfect location for serving up a meal fresh out of the oven or hot off the grill. Ready. Set. Dine. Speaking of meals, the kitchen in these new East Atlanta townhomes overlooks both your dining area and family room. While touring our model and available inventory you’ll find several chic finishes throughout the kitchens. Among these are quartz countertops, spacious cabinetry, and stainless steel appliances. Once it’s stocked with your favorite cookbooks and cookware you’ll be ready to whip up your own culinary masterpieces in no time. At the end of a long day, your master suite is where you’ll go to relax and unwind. The master bedrooms throughout these new townhomes in Heights at Grant Park give you enough space for your bedroom set in addition to creating a comfortable sitting area. It’s not only a space to escape the hustle and bustle of daily life, but also a dreamy place to lay your head at night. If you’re looking for a new home in East Atlanta, now is the time to come tour the available homes in Heights at Grant Park. We have two incredible offers happening now, but only for a limited time. For home buyers, you can take advantage of up to $10,000 towards your new home as part of our New Year, New Home promotion. We’re also giving a 5-day cruise to the Caribbean to agents who sell at least 2 homes in Heights at Grant Park or Eastland Gates by March 31, 2019. What are you waiting for? Contact us today to schedule your tour and make the move from envisioning yourself in our new Heights at Grant Park townhomes to making it your forever home.